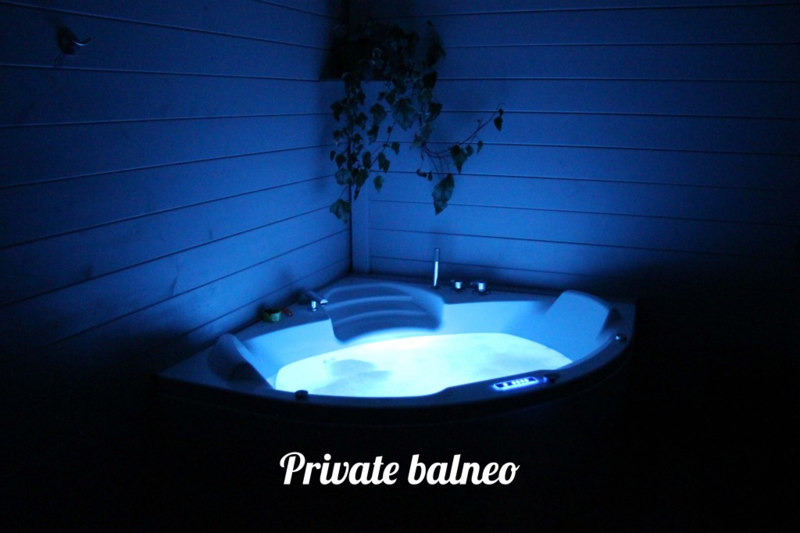 Installed in a chalet alongside your bubble is a private bathroom at your disposal. To complete the experience, Bulle d’R wanted to add a little extra – the hot tub! : Balneotherapy. For your comfort (and of course your pleasure) the hot tub is for your exclusive use. This is included in the daily rate! Sheltered under the roof of the wooden chalet, you can use the tub without affecting the environment. Unlimited usage permitted throughout your stay! Away from the rest of the world, you can make the most of this wide bath equipped for “balneotherapy”. Sit back, relax and enjoy! This whirlpool bath recycles its water, providing a massaging effect. Enjoy the bubbles. There’s nothing quite like it! An invigorating shower equally awaits you in the bathroom. Experiment with chromatherapy, the different colours with the light diffuser induces a sense of calm and meditation. Colours are known to affect mood and this is widely accepted, but also can influence the body. India and China have practised colour therapy for centuries and advocate the effects on well-being, including psychological well-being. To complete your experience, Bulle d’R suggests the option of a massage! It contains 5 ampoules of oil to be used in conjunction with massage, at those intimate moments during your stay, to encourage relaxation and pleasure. Nadine and Cédric have taken every step to ensure a relaxing stay at Bulle d’R. 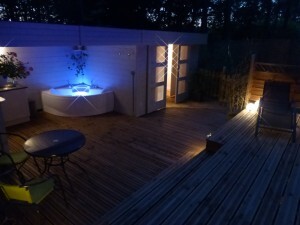 The hot tub is the latest addition to enhance your experience and really evoke a lost paradise. A garden of Eden awaits you.